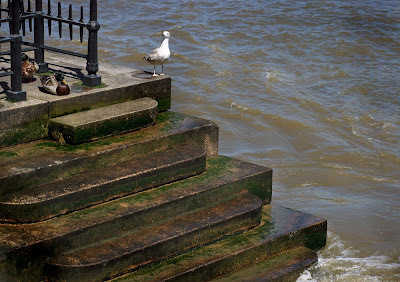 A territorial gull on the Thames. Did you hear on the news today about that woman that was attacked by a seagull? She suffered quite a serious injury to her head. I just realised that I wrote that like a joke, but with no laugh! My trips to Europe have convinced me that although smaller than the common gulls down here in Tasmania, they are a bit more aggressive! Personally, I feel that it is the influence of Soccer hooligans. I just knew that seagull is agressive!